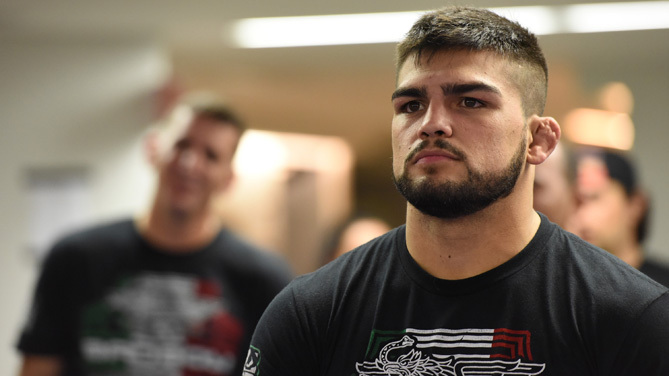 Former Ultimate Fighter winner Kelvin Gastelum gets his wish on Saturday, November 21, as he will return to the welterweight division to face fifth-ranked contender Matt "The Immortal" Brown, in the main event of UFC Fight Night at Arena Monterrey in Monterrey, Mexico. Also announced today was a lightweight matchup between another former TUF winner, Efrain Escudero, and Brazil's Leandro Silva. Tickets for the event, which will air live on FOX Sports 1, go on sale on September 11. TUF LATAM 2 will begin airing the week of August 26th through UFC Network, UFCFIGHTPASS.com, and additional free-to-air partners within Latin America. Winners of the season will be determined on the Monterrey card, which also features the shows coaches, Gastelum and Escudero. Owner of a 4-1 record at 170 pounds, Gastelum made a brief move back to the middleweight division in June, but after a second-round finish of Nate Marquardt, he will move back to welterweight to face Brown, who has won eight of his last 10, including a July submission of Tim Means. Currently on a two-fight winning streak, Escudero is showing the best form of his UFC career, and he wants to keep the momentum going against Silva, who is unbeaten in his last three. Stay tuned to UFC.com for further details on the event, including detailed ticket information and fight card announcements.